This Thursday, Nov 3, 2016, in Fort Lauderdale, public presentation of Management Myths and Time Span. Register here. In your workshop, for the bottom three layers, S-I-II-III, you said there was an internal focus. What happens at S-IV and S-V? The Basic Building Block (S-I-II-III) populates every organization, no matter how big or how small. These layers have an overriding internal focus. Why? Because, we told them they had to be internally focused. We (S-IV and S-V) created very specific work instructions, to be efficient, profitable, no waste, no scrap, high utilization of available resources. Those work instructions are internally focused. To be effective at S-IV requires a combined internal and external system focus. As the organization grows, it creates more than one system. It ends up with multiple systems and sub-systems. Individual roles grow up into teams. Teams are created inside a single function, or department. With multiple departments (multiple systems and sub-systems) we observe the silo effect. Silos don’t get along with other because they are internally focused. This internal focus is normal. We told each S-III system to be internally focused, but now we have a silo problem. You likely heard you need to get rid of your silos. Wrong. You need those silos AND you need those silos to be internally focused (efficient, profitable and predictable). The resolution to the silo issue is not to get rid of them, but to integrate them together. Multi-system integration at S-IV requires an internal AND an external focus. Roles at S-IV have to be able to see outside a single serial system and understand the impact of one system on another system. Roles at S-IV are integration roles, optimizing multi-system output and transitions or work handoffs from one system to another system. 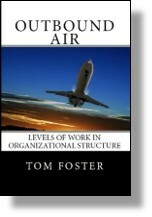 This entry was posted in Organization Structure and tagged external focus, internal focus, organizational structure on October 31, 2016 by Tom Foster.